Most Americans are at least “somewhat confident” the recent national election was well administered, and that their vote was counted properly. According to the Pew Center, more than 80 percent of U.S. adults surveyed had a high degree of confidence this had occurred. Yet the post-election coverage and blogging gave the impression that people in different parts of the country felt there was a lot of cheating. The Pew inquiry presumes all the votes that were counted legitimate. This may be a specious assumption. “Count every ballot because every ballot counts” is a nice slogan that hits at core democratic sentiments, but ignores the reality that election fraud exists. Fund’s reporting described how the DOI sent undercover agents to 63 polling places during the 2013 municipal elections pretending to be voters who should have been turned away from the polls because they were dead, in jail, or had moved out of the city. In 97 percent of cases, Fund writes, they were allowed to vote anyway. How this could happen even after the reforms enacted after the “long count” presidential election of 2000 is a question sorely in need of an exploration. First and foremost, the voter rolls are still not clean. Efforts to make them so are, often without any critical analysis, described in the media as “voter suppression” by which is meant white conservatives trying to keep non-whites from voting. This was certainly the charge in Georgia in 2018. Democrats accused Republican gubernatorial nominee Brian Kemp—at the time also the state official in charge of supervising elections—of failing to process 53,000 last-minute voter registration applications in time for those applicants to be able to vote. The charge made Kemp look like a bad guy and was politically damaging, especially when the election turned out to be so close. 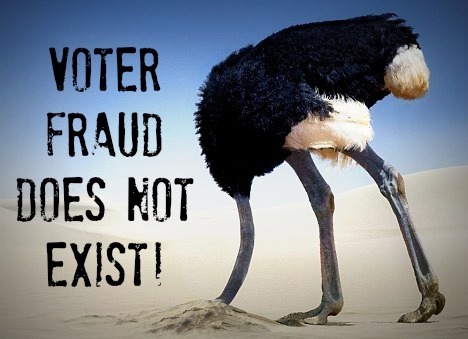 What didn’t get as widely reported was that according to the Republican National Lawyers’ Association (RNLA) more than 9,000 of those late registrants were not old enough to vote, nearly 3,000 had used a fake address on their application, and almost 6,000 were already registered. It may all be on the up and up, but it certainly looks suspicious. The expansion of Election Day into Election Month through early voting makes fraud more possible, not less. For the sake of convenience and to avoid unintentionally disenfranchising anyone, voters who would not be present to vote on Election Day are allowed in many places to vote early in a centralized location or by absentee ballot. These processes are a lot harder to police than traditional balloting and can lead to abuses like “vote harvesting,” a term new to many but in some states already illegal. There are ways to fix these issues before they become a further embarrassment. The names of the dead should routinely be removed from the rolls of those eligible to vote as should the names of those who have moved. This is information regularly reported to and acted upon by other agencies of government. Adding the State Board of Elections to the list of those who are should not be difficult. Transparency in counting would also be a welcome addition, especially during recounts. How hard would it be to mandate that all recounts be shown to the public via the Internet, as a disincentive to cheat? The number of absentee ballots requested, mailed, and returned needs to be certified by Election Day. Those that are “found” late need to be scrutinized with the same care given to provisional ballots and not presumed to be valid on their face. Early voting needs to be curtailed. Elections should be a kind of “one-day sale” representing a national consensus rather than an amalgam of opinions held by those who can be dragged to the polls by special interest groups over a period of days or weeks. None of these reforms or any similar efforts are disenfranchising. Instead, they help protect the integrity of the ballot and the principle of one person, one vote that underscores our republican form of government and safeguards our liberty.